Good news: I have been charged only £5.00 for going 70p into the red last week as I reported here. While this is still somewhat disproportionate, the author believes this is fair because the bank was paying its own cash to cover the unauthorised overdraft. Please see the comments below for continued discussion of whether the £5 was fair. Obtier, in jurisprudence, we learned the importance of symobolism in legal theory and practice. Lady Justitia is, perhaps, my favourite of all characters. 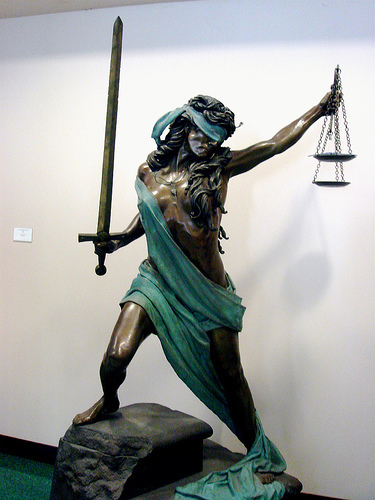 Justitia has been depicted most commonly as a matron carrying a sword and scales, sometimes wearing a blindfold. In the context of University law exams the matriculation number replacing the student’s name is perhaps the examiner’s equivalent of Justitia’s blindfold: that marks should be impartial, unbiased and justified. But I digress. I have a small bank charge to pay and won’t make the mistake of mixing up my bank cards next time! Want to learn more about Lady Justice? See this Sword and Scales book, this Wikipedia article or WardblawG’s collection of Justitia Pictures. I find it difficult to believe you think £5 is a reasonable charge for going overdrawn 70p. I appreciate it is your money and your entitled to accept such a charge, but even charging £5 for 70p is ridiculous. You are correct to point in law that symbolism is important, but even if these charges were default charges for breach of contract, in contract law punitive charges are illegal, so such symbolism is not allowed. Also that is the wrong analysis here, because the whole point of the supreme court decision was the charges bank's were charging were not default charges for breach of contract, but service charges, therefore, for borrowing 70p, the bank is charging you for that service £5!!! Imagine I leant you 70p for a day and wanted £5 back by the next morning, you could quite rightly accuse me of opportunistically taking advantage of your vulnerable position and you would be right to. Setting aside the small amount of the charge it is still a ridiculous level of charge and more importantly, when you consider that these charges are being applied to the accounts of some of the lowest income groups in the country it's even more unacceptable. More so when you consider the lack of competition in the banking sector. I understand the £5 may not be much an inconvenience for you, but as a matter of principle it is a ridiculous level of charge. Thank you for your comment. You raise some interesting points. My post here was perhaps a rather rash response when I believed I was going to be charged £20 instead of that £5. Second, I agree entirely that if that cash is for service, then the £5 charge for lending 70p is unwarranted. However, I do still believe that it was the bank's money and I had no right to go overdrawn, which in legal terms means I am paying with the bank's cash, which is a transaction unauthorised by the bank. While punitive costs would, as you said, not be appropriate or even legal, it has to be wondered what the world would be like if anyone could just go overdrawn, eating into the bank's cash. I think what you'd have is a lot more banks going into the red, with increased uncertainty. I think the £5 charge is a good way to keep the floodgates tightly shut. Further, as an aside, I notice that I had gone off on a massive tangent re symbolism. My comments on symbolism were not intended to refer specifically to the bank charges scenario. But, if you are looking at symbolism, what should be happening is Justicia striking down those banks that continue to charge overdrawn customers ridiculously disproportionate amounts. Miss Walls was, unfortunately, struck down by the lawyers for Santander in the small claims court in Glasgow. I hope human rights arguments get her case back on track so she can, effectively, punish Santander and his Lordship who said that the legal issues were too complicated to be heard in the small claims court: what century are we living in here? Blake is an interesting case, particularly as it relates to the breach of the Official Secrets Act, conduct which would normally be punishable by criminal procedure rather than civil. I do tend to think also as Her Majesty's Attorney General in that case cited a public interest rather than the private contractual interest of the crown, the case is probably quite exceptional and could be distinguished from a normal commercial contract where only private interests are concerned and the conduct is not one that would normally be punishable by the criminal law. The issue is raised in the case also the civil law was being used, where the criminal law would not provide a satisfactory resolution. However, that aside, I think there is an important issue here and that is whether banks should be able to used some form of symbolic penalty to stop the floodgates being opened. I would disagree simply as, one the banks did argue initially that was part of the reason they used charges and also that it was to recoup their losses. However, as was shown clearly in the Supreme Court test case, the real motivation of the banks was to profit and they were in actual fact cross subsidising accounts. 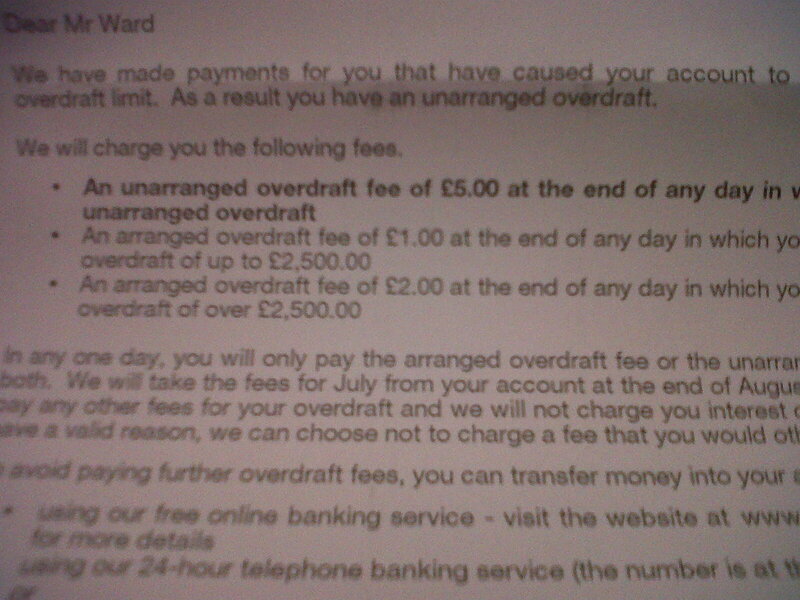 Also the whole concept of an unauthorised overdraft is a weak one now also. The banks relied on the fact the charges were service charges and not penalities on default, which makes me take the few to exceed the agreed limit on your overdraft is not a default (in a sense they have personally barred themselves from making such an argument). Arguably when you exceed you agreed overdraft limit, you enter a new limit with new level of service charges. They have to decide, if it not authorised, in which case is the charge a penalty for defaulting on your agreement (and arguably, therefore can be subject to the UTCCR 1999) or is it a service charge for exceeding your agreed limit – which suggests it not a breach of your agreement. Either way, I agree when your in the position both myself and you are in where you can dismiss a £5 charge and pay it, everything is fine. Where, however, that charge for exceeding your limit by 70p is incurred by someone on £64 per week, it is going to have a far more harsh effect on them and by any standards is disproportionate. Also what happens when the person can't pay that £5, or if they do, cannot make the next payment and another £5 is applied and then another and another? Pretty ridiculous, especially when you consider if you try and defend court action by them against you or raise a small claims action against them, your going to need senior counsel. Update: this was £5 PER DAY overdrawn, which is absolutely ridiculous. How can that be justified as an administration charge when the whole process is automated? It’s just circumventing the previous rulings by the OFT on what is deemed an unfair bank charge ie over £12. See http://www.govanlc.com/bankcharges.html for more info. Another Update: Govan Law Centre’s Sharp v Bank of Scotland case has been refused legal aid from the SLAB as per this article by Govan LC http://govanlc.blogspot.com/2010/12/response-to-scottish-legal-aid-board.html . It appears that this has been a fatal, yet ill-advised, and perhaps unjustified blow to Scottish consumers re the generally availability of civil legal aid for Scottish consumers to pursue claims for unfair bank charges.